REDWOOD CITY, Calif.--(BUSINESS WIRE)--E la Carte, Inc., creator of the in-restaurant PrestoPrime EMV tabletop system, announced it will deploy its latest-generation PrestoPrime EMV tabletop terminals across Applebee’s restaurants in the U.S. A leader in technology innovation, Applebee’s first began providing the Presto tablets in 2014 and will be continuing to provide them for multiple years, in order to give casual-dining guests more control over their dining experiences, increase operational efficiencies and more accurately track guest feedback. With this latest deployment, Applebee’s will continue to exclusively offer the newest and most innovative guest tablet technology with the PrestoPrime EMV tablet. E la Carte will be demonstrating its new PrestoPrime EMV terminal at the industry-renowned Restaurant Leadership Conference on April 15-18 in Phoenix, AZ. To learn more about the PrestoPrime EMV terminal, visit www.elacarte.com or email us at info@elacarte.com. E la Carte, developer of the PrestoPrime™ EMV systems, leads the table-top dining revolution with its best-in-class e-commerce and payments system. 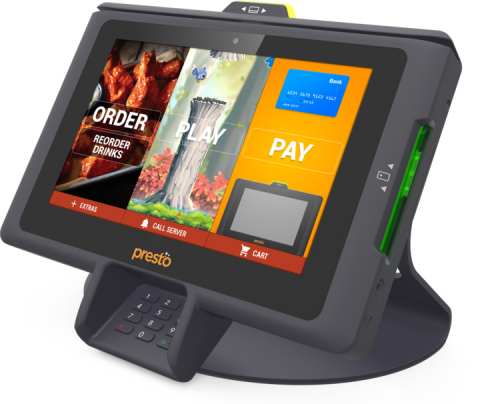 With close to 100,000 systems deployed at leading restaurant brands across the country, the Presto System enables restaurant guests to take greater control over their dining experiences by allowing them to order from a full menu, play exciting interactive games, and pay their bills directly from the table. The PrestoPrime EMV System also provides operational and financial benefits to restaurant operators, which drive increased profitability and unlock previously inaccessible restaurant data, enabling smarter decisions related to guest satisfaction.